Heat oven to 350°F. 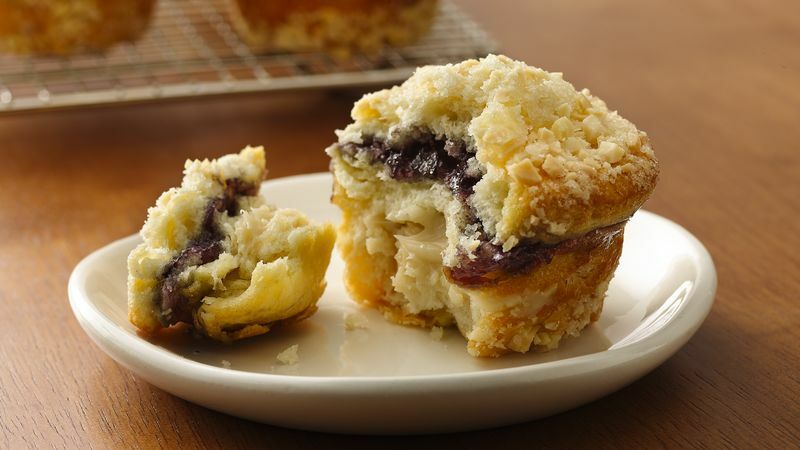 Generously spray 8 regular-size muffin cups (2 3/4 x 1 1/4 inches) with cooking spray. In medium bowl, stir cream cheese, 1/4 cup of the sugar, almond extract and vanilla until smooth and creamy; set aside. In medium shallow bowl, mix almonds and remaining 1/4 cup sugar. Separate dough into 8 biscuits. Separate 1 biscuit into 3 layers. Brush 1 layer with melted butter. Firmly press layer, butter side down, into almond mixture, coating evenly. Place layer, almond side down, in bottom and up side of muffin cup. Fill with 1 tablespoon cream cheese mixture; spread evenly. Top with second biscuit layer; press edges of layers together. Spoon 1/2 tablespoon of the preserves onto middle of second layer. Brush third biscuit layer with melted butter; firmly press, butter side down, into almond mixture. Place third layer, almond side up, on second layer; press edge of third layer into edge of second layer. Repeat with remaining biscuits, refrigerating biscuits if dough becomes too soft to separate. Sprinkle any remaining almond mixture onto tops of biscuits. Bake 17 to 27 minutes or until golden brown. Cool in pan 10 minutes. Remove muffins from pan to cooling rack. Cool 15 minutes before serving.